All communication "as the client"
Many online businesses are now turning to affiliate / partner channels as a means by which to grow revenues. The presence of traditional affiliate publishers is, to some degree, being eroded in the natural search results as the search engines seek to remove the 'middle man' and give greater prominence to direct service and product providers. Many traditional affiliates have relied upon paid (PPC) search in driving traffic but this channel is also now under pressure as merchants and service providers restrict bidding on brands and the search engines simultaneously impose ever tougher landing page quality controls. Many traditional affiliate publishers are thus unable to maintain traffic levels. Merchants and service providers are therefore recognising the need to widen the net in seeking out relevant "long tail" partner sites that have string and sustainable search engine rankings for relevant terms but which have not historically acted as affiliates. Identifying and recruiting such partners is a non-trivial task. They need to be identified based upon rankings for relevant terms; site quality needs to be assessed and the recruitment process itself needs to be handled professionally. 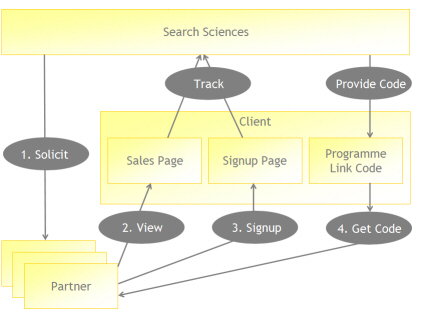 The following diagram shows an example of our affiliate recruitment solution in action. Models can vary, particularly the client components as these will be determined by your affiliate programme -- more on this later. 1) Solicit. Our targeting technologies result in the delivery of customised and personalised mails to potential affiliate partners. 2) View. Some of these may simply take a look at the client`s affiliate signup / sales page - we will record all such viewings, remotely updating our central systems. 3) Signup. Of these partners, a percentage will sign up and join the client's affiliate programme. This may, optionally, include a number of sites: many partners will have more than one relevant site. All sign-ups are also recorded, providing a view as to overall conversion rates. 4) Get code. The partner will then need the code for the link to the client site. In some cases this will include a tracking code, in others it will not. Much of this depends upon the nature of the client`s affiliate programme (more on this below). 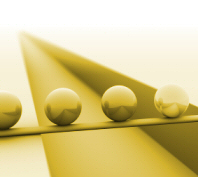 Search Sciences can remotely provide code selection based upon category without being visible in the process. Remote tracking occurs throughout the process, with the client site components of our affiliate recruitment system recording and updating the status of all solicited partners. Duplicate content penalties - although some of the search engines can recognise tracking codes and ignore them when indexing a site, some of them still struggle with this. Since the affiliate links will be indexed by the search engines, they are now "seeing" multiple URLs, all pointing to what is otherwise an identical page. No link ranking - although, again, the search engines will index affiliate links, in most cases they are likely to be recognised as such and will not be valued as inbound links to the client`s site. Affiliate link penalties - some partners may even be concerned that the presence of affiliate links on their site may be harmful to their long term rankings. Frankly, given the pressure that mainstream affiliate publishers are now seeing, it can be hard to argue against this. All of the above strongly suggests that, where possible (and we recognise that this is not always an option), tracking codes should be replaced with on-site tracking. Where we design a programme, we recommend that clients track using the referring domain which involves very simple on-page code and cookie setting. We can happily supply this as part of the implementation. In some cases, it is also possible to 'wrap' existing affiliate tracking URLs, removing visible tracking whilst maintaining it internally.